WorldClassRoom FAQs - Where is the syllabus? The course syllabus can be accessed from the course tool menu on the left hand side of the screen. If you scroll down to the bottom of the syllabus page in non-SBT courses, you will notice a table summarizing all the activities (e.g., assignments, discussions, and quizzes) attached with a due date and a grade. The table is automatically generated and maintained. The learning activities in the table appear in chronological order. 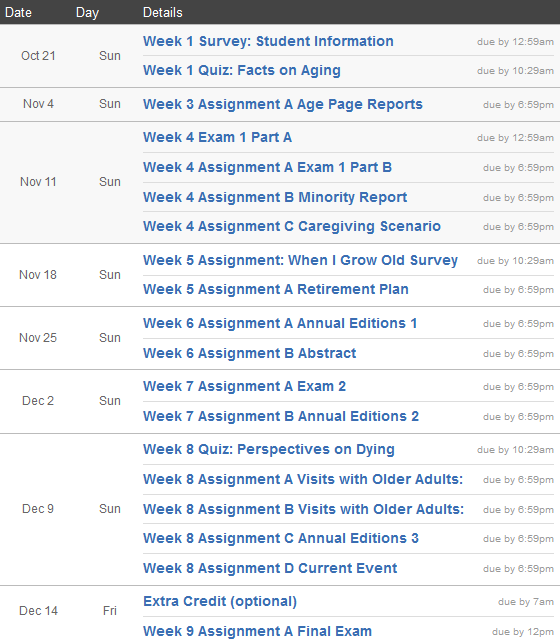 This table is a nice tool for you to keep track of all the required course work in a course. SBT courses will have this schedule under the "Course Schedule" button. How Do I Roll Over My Concourse Syllabus?